We produce for Italy and abroad decostick finger food ice cream molds decoration. 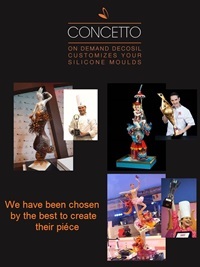 Italian leaders of silicone moulds, we create and sell for over 10 years decostick finger food ice cream molds decoration, food safe silicone moulds worldwide to confectioners, bakeries and Delicatessens. Line of food silicone molds dedicated to the creation of subjects or geometric shapes supported by sticks to get a walking snack or dessert. It can be used with liquid products like chocolate, sugar, mousse, Bavarian, popsicles, fruit jellies such as ice cream or paste, marzipan, tartare meat, fish, cheese or vegetarian. The food silicone mold decoStick® is composed by two parts: a base of a soft translucent silicone and black silicone stiffer stripe of closure, which gives greater stability to the mold, it locks solidly and it supports the stick. It allows you to fill the mold with pasty products without the stick moves, preventing leakage of liquid and it allows you to extract the subject from the mold easily without deforming. In the lower part of the decoStick® mold there are partial cracks that allow a faster cooling of the compounds in the blast chiller.